Schönberg — For more than 100 years the Reiling group has collected and recovered recyclable materials and has thus contributed to the preserving of resources and to environmental and climate protection. Since the 1950ies Reiling has developed into one of Germany’s leading glass recycling specialists that today recycles almost all types of container and flat glass and also processes glass from photovoltaic modules. 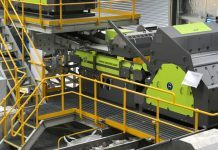 Through KRS Recycling Systems GmbH, a company specialising in recycling systems for the hollow and flat glass industry, the companies of the Reiling group have already been using several generations of Sesotec recycling sorting systems. As head office and biggest facility, Reiling Marienfeld was one of the first companies using the new Sesotec K9 systems. In Marienfeld the K9 recycling sorting systems among others are used for the colour sorting of cullet starting from a grain size of three millimetres. The result is a considerable quality improvement in the recycling of fine, hollow, and flat glass, with high throughput capacities. At this facility the K9 separators also demonstrate their advantages in the field of glass recycling. In a specifically designed reject system all of the separated material (rejects) from the main systems is processed once again to recover high-quality end products and to considerably minimise the total amount of waste and loss of glass. After several drying processes the material is screened and is then sent through K9 separators that are divided on two sorting lines. „With these K9 systems both the quantity and the quality of the end product could be clearly increased“, summarises Marc Uphoff, managing director of the Reiling group. The latest installation at the Reiling plant in Osterweddingen comprises a coarse and medium grain line without drying. In this line Sesotec sorting systems of type „Spektrum Basic“ are used for the separation of CSP and metals. It is also worth mentioning that the Reiling group also relies on Sesotec recycling sorting systems in the segment of plastics recycling. At the plants in Marienfeld and Hamm-Uentrop Sesotec „Flake purifier“ systems are used in the recycling of PET flakes. Equipped with metal search coils for the detection of metals and true-colour sensors for the separation of wrong colours these sorting systems ensure highest end product qualities with minimum loss of good material. With twelve German and four international locations the recycling company provides a versatile spectrum of services. Business operations include the fields of glass, PET, wood, electronic scrap, paper, file and data media destruction/archiving, municipal services, and refuse derived fuel. The Reiling group covers the complete recycling bandwidth – from collection, transportation and processing through to the supply of high-quality recyclates. To date Reiling has grown into a large group of companies but has at its core remained a typical family-run enterprise that today is managed in the fourth generation.